My Dad brought this one home for me one night. He could always be counted on to pick up a new Treasury Edition if he happened to spot one during his frequent cigarette runs. 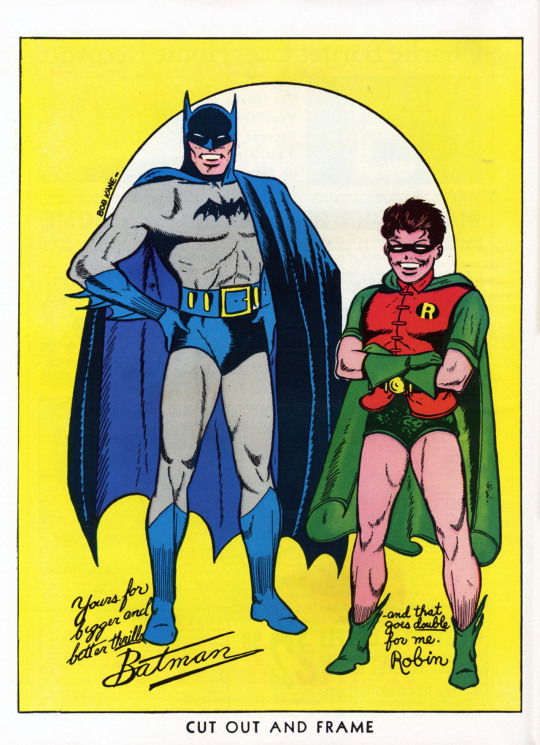 I wasn’t the hugest Batman fan in the world, but just look at that cover–it is absolutely iconic. 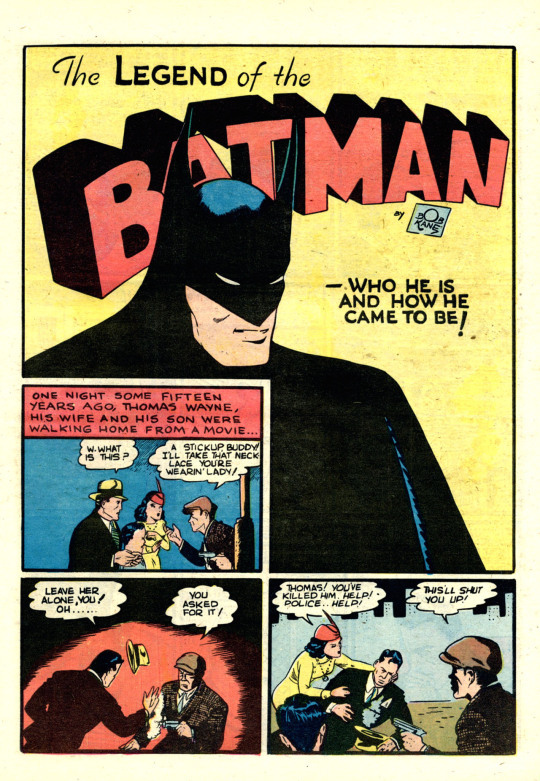 I can’t be certain that this is where I learned the origin of Batman–thinking about it, it was more likely in that BATMAN SPECTACULAR that reprinted the story about Thomas Wayne donning a Batman-like costume. But it feels like information that I’ve always possessed, you know? Like an essential fact of the universe that I was born knowing. In any case, here I got to experience the original, in all of its crude, swiped glory. It must be said, BATMAN #1 is a great, great issue. Everything in it is significant. 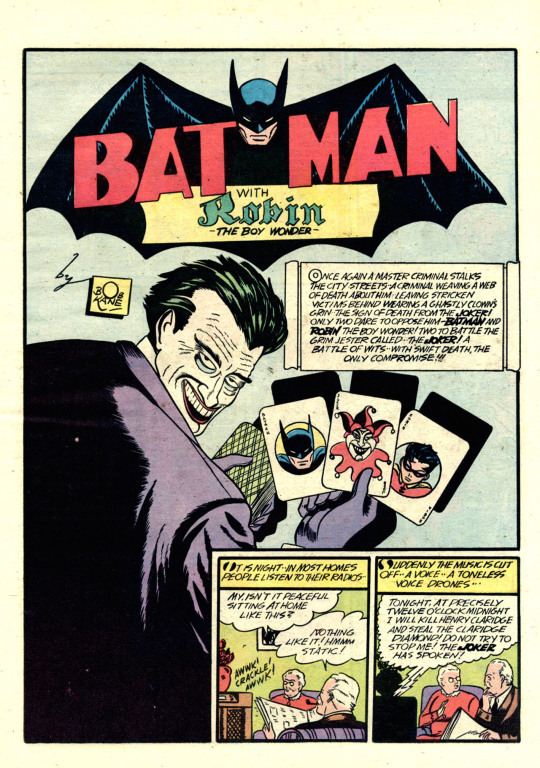 And nothing more so than this lead story which introduces the Joker. He’s not simply a Prince of Mirth in these early stories, but a hardened killer, completely without morals or mercy. He also kicks the crap out of Batman in their first meeting, throwing him off a bridge for good measure. 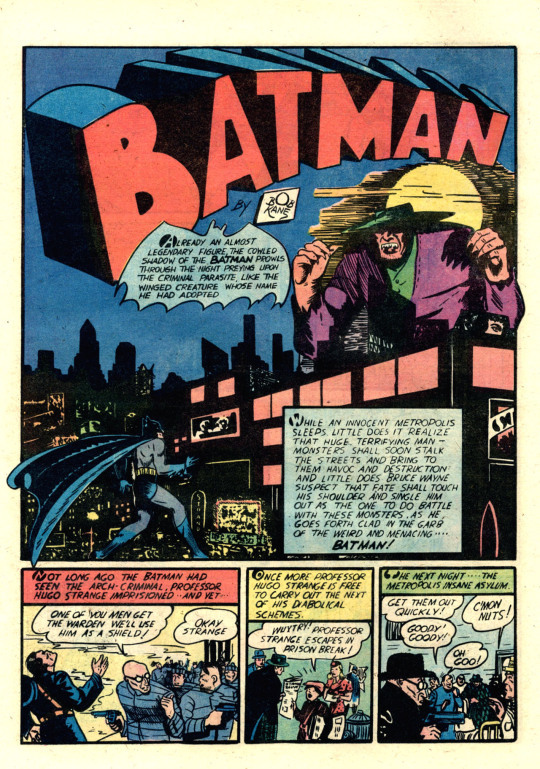 This guy wasn’t kidding around, and he continues on a murder spree that claims several victims before the Caped Crusader can bring him to rout. 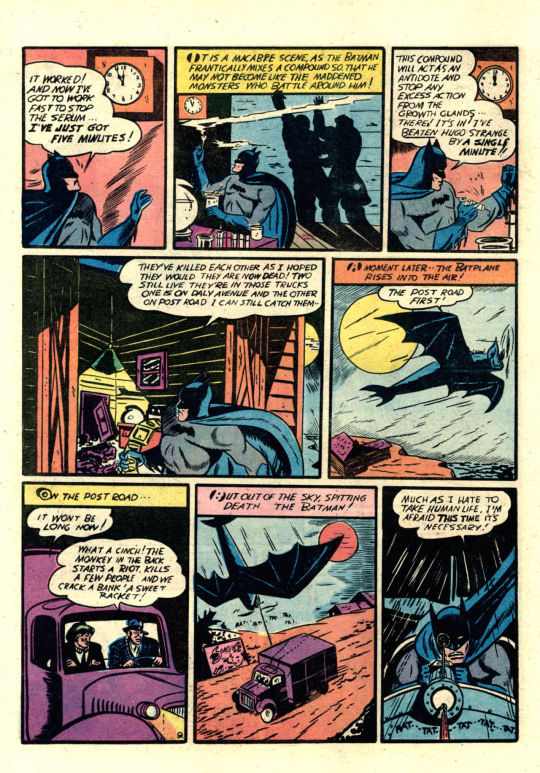 The early Batman wore a bullet-proof vest, one apparently so effective that it also cancelled out the force of the impacts. Good old Wayne technology! By the end of this story, the Joker is in prison, but he vows to escape and return again–and he doesn’t even wait a whole issue to do so, as we shall see. Next came a story that had been prepared earlier, before new-arrival Robin had been introduced into the strip. 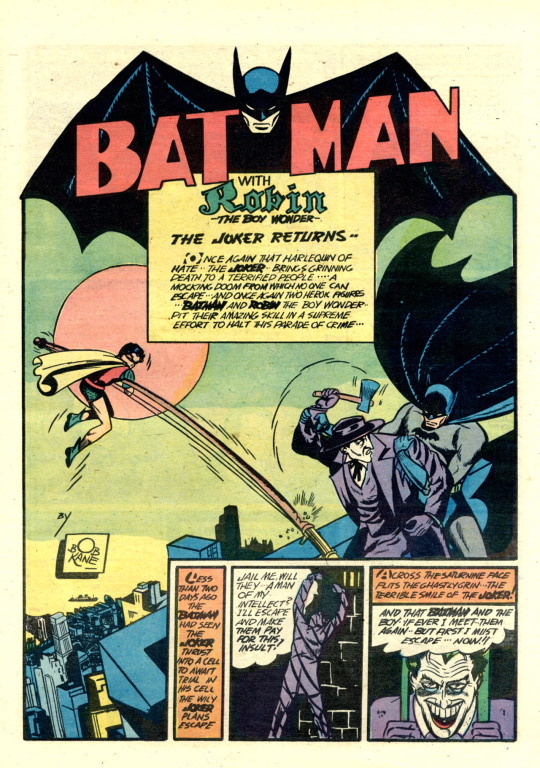 It featured the return of Batman’s enemy Dr. Hugo Strange, whom he had defeated some months earlier. In this tale, Hugo is turning men into monsters chemically, and equipping them with bullet-proof clothing (no doubt purchased from Wayne Tech, damn it!) to wreak havoc in his name. 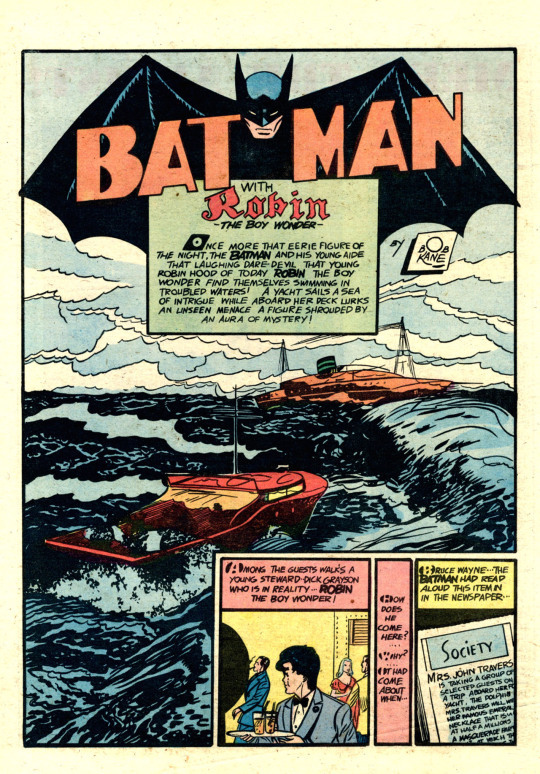 This is the famous story in which Batman gunned down the Monster Men with a machine gun in his Batplane, before hanging one from a rope thrown from the same cockpit. In the aftermath of complaints, and fearing for their newfound respectability, the owners of DC instituted an in-house policy of behavior governing super heroes that prohibited them, among other things, from taking life. This applied to Superman and everybody else as well, in addition to Batman. 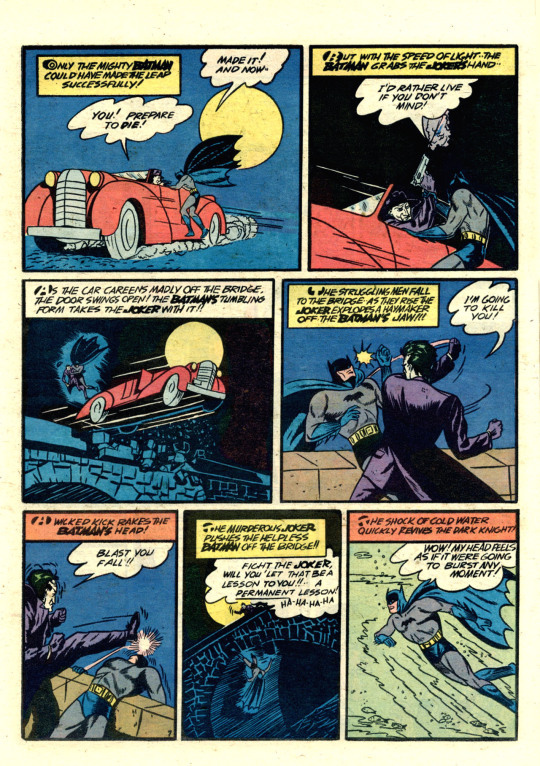 These days, of course, Batman is happy to gun people down with vehicle-mounted weapons in any of his many films. The third story in the issue introduced the Catwoman, who here was a simple jewel thief called the Cat. 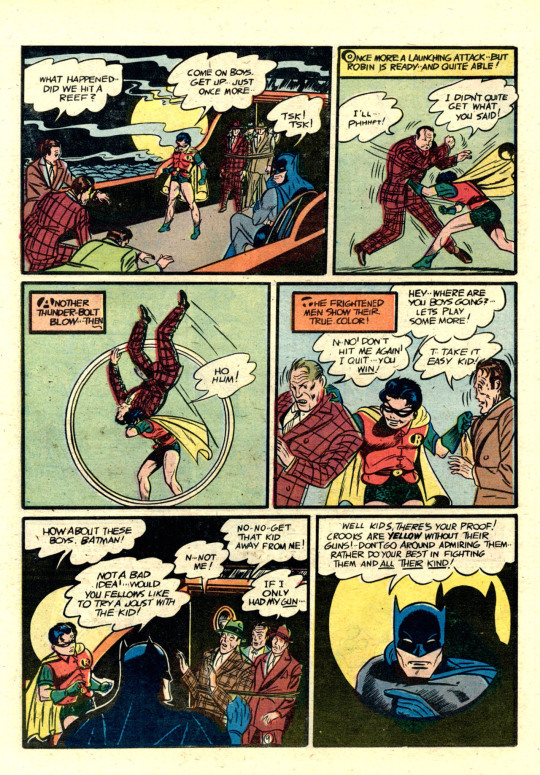 Apparently, Bill Finger and Bob Kane liked her, because they kept bringing her back, eventually putting her into a striking costume of her own. Here, though, she’s a pretty standard femme fatale. 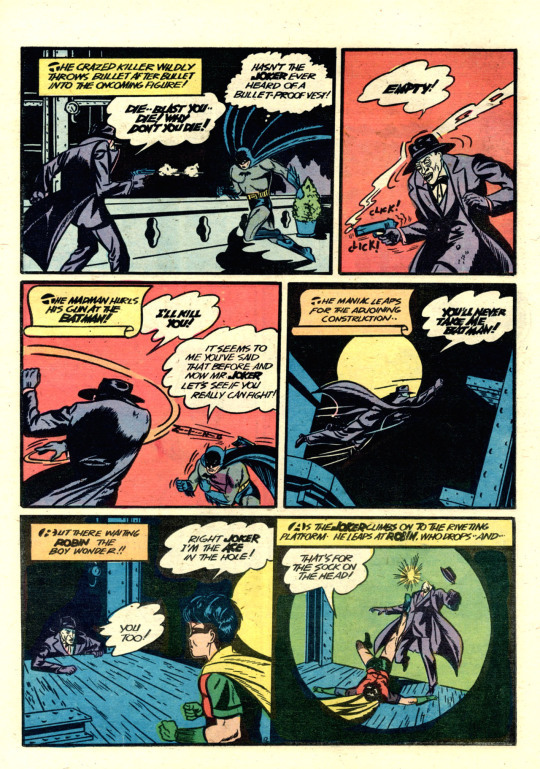 The best sequence in this story is this one, where Batman stops the action to teach his young readers that criminals are all cowards without their guns. he does this by letting a trio of bad guys take on young Robin. I don’t mean to imply that perhaps this fight was rigged in the Boy Wonder’s favor, but his is the only name among the combatants to be featured in the logo, after all. Then it’s time for the return engagement. The Joker wastes no time in getting himself out of prison with chemicals hidden inside false teeth, and he renews his campaign of terror against Gotham, targeting citizens who offend his sensibilities. Despite Batman’s best efforts, he succeeds again in claiming the lives of several. 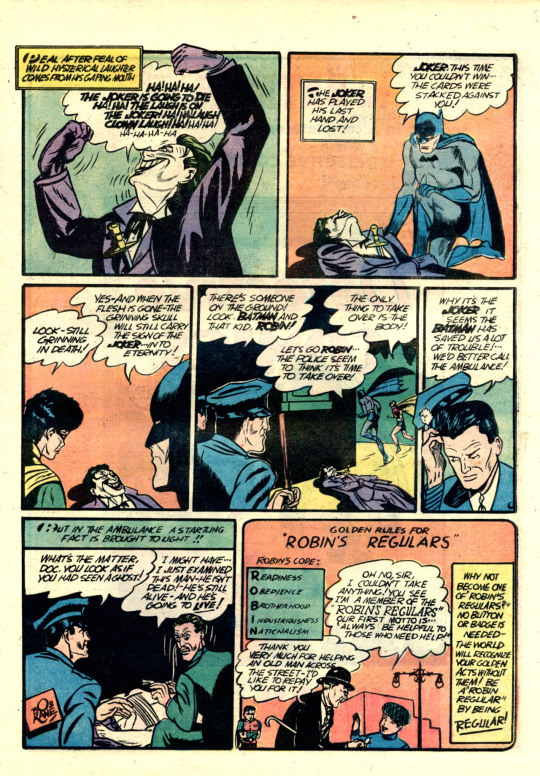 In the end, during a fierce struggle with Batman, the Joker winds up accidentally stabbing himself. Legend has it that editor Whit Ellsworth had Kane redraw the final panel, realizing that they had a villain here who was too good to kill off in such a fashion.